It’s Monday! That means it’s time for another Taylor Joelle Children’s Style Guide. This week we have three new children’s fashion looks for Easter put together by the designer and founder of Taylor Joelle Designs, Jenny. If you are looking for the perfect look for your kids for Easter that will set them all apart but also look great as a group, you have come to the right place! We know that you’ll be inspired! Our first Easter look is for a baby girl. Start the look with this Yellow Ruffled Dress from gap.com, layer the look with this White Cardigan from oldnavy.gap.com. Top it off with this adorable handmade headband from LeBebeBowtique on Etsy.com. Complete the look with the Silver Metallic Ruffle Shoes from taylorjoelle.com. The next Easter look is for the brother of the family. 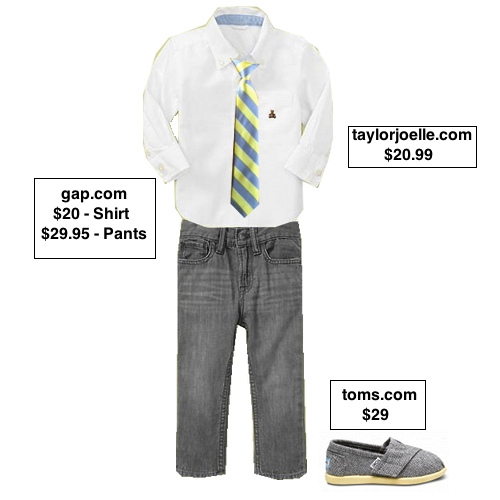 Start the look with these Classic Oxford Shirt from gap.com. Add a touch of class and style with this Yellow and Gray Skinny Tie from taylorjoelle.com (you might also consider getting a matching Daddy and Son tie set). Next, add Lightweight Straight Jeans from gap.com. Finish the look with the comfortable and fashionable Tiny Toms Classics from Toms.com. The last Easter look is for the older sister of the bunch. Start the look with this Girls Stripe Bateau Dress from jcrew.com. Top it off with this Embroidered Flower Headwrap from Forever21.com. Finish the look with these Heather Ballet Flats from Target.com.